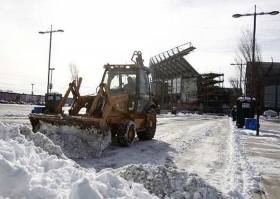 A front end loader clears snow from the parking lot at the Philadelphia Eagles stadium in Philadelphia, Pa., on Monday. DETROIT -- Not even a foot or more of snow is going to separate Northeast auto dealers from their customers during the last week of the year. “We will do what it takes,” said Susan Scarola, vice chairman of DCH Auto Group in the South Amboy, N.J., area where dealers had to dig out after a Dec. 26-27 blizzard that blanketed the East Coast from Baltimore to Maine with as much as 32 inches of snow. “Our objective is to clean out and get the businesses open as quick as possible as we try to make up for Monday,” she said Wednesday. Ross Polinow, general manager of Piazza Honda of Philadelphia, said the city got a foot of snow with wind gusts of up to 50 mph. Polinow's staff spent part of Monday morning clearing cars in the lot and plowing. He had the dealership open by 11 a.m.
Mike Hills of Acton Toyota in Littleton, Mass., said snow caused some service cancellations, but didn't really hurt sales. Scarola said it's vital to quickly clear snow from dealerships' new and used car lots during the hot-selling period between Christmas and Dec. 31 -- and nothing would prevent her stores from doing so. The massive storm, which caused airlines to cancel more than 1,000 flights and snarled traffic for days in New York and other cities, could have had a bigger impact if it had started on a weekday instead of Sunday when most dealerships are closed, said Rebecca Lindland, senior analyst for IHS Automotive. “It's one lost day, but most dealers can make it up this week so the effect is very limited,” she said. Analyst Ivan Drury of Edmunds.com said the storm did not change his firm's forecast of a seasonally adjusted selling rate of 12.4 million light vehicles for December.